“When you have a population of street-based youth in a wealthy area, there’s going to be conflict and tension," said Jacqueline Boyd, a co-founder of Project Fierce Chicago, a new organization aimed at creating a long-term homeless living facility for LGBTQ youth. Boyd&apos;s criticisms stemmed around the Lakeview neighborhood specifically, an area both known for its large and affluent LGBTQ population and its recent spate of derisive attitudes towards the actions and presence of LGBTQ youth in the neighborhood (especially those of color). While the majority of LGBTQ services are in the Lakeview area, there is a dearth of resources on the South and West Sides of the city. Especially relevant is the more than 15,000 homeless youth in Chicago. Boyd estimates that a quarter are LGBTQ youth. “They’re trying to grow and develop in the same way that everyone else is, but there’s no housing," she said. In order to combat these numbers, Project Fierce Chicago aims to create a new model for long-term and stable transitional housing for this population. 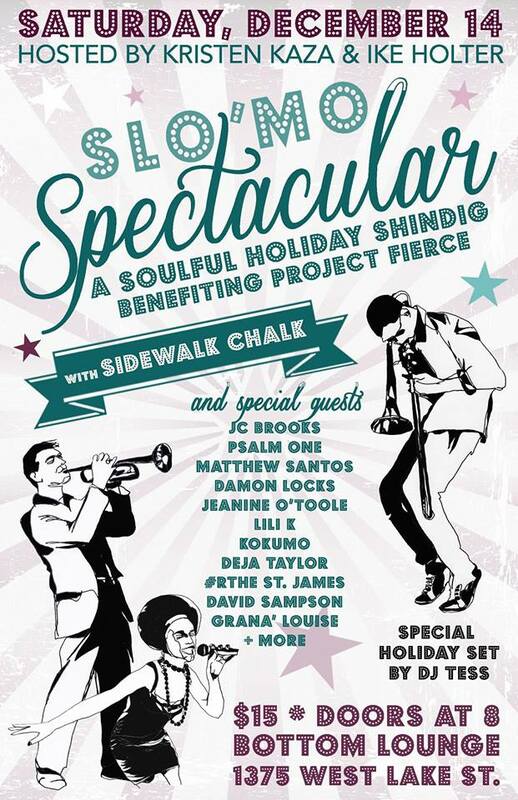 Fundraising efforts are currently underway, including tomorrow&apos;s Slo &apos;Mo Spectacular: A Soulful Holiday Shindig! Featuring 18 performers including r&b band Sidewalk Chalk, Psalm One, and JC Brooks, fundraising efforts will go to future Project Fierce Chicago costs. Their goal is to house 5-10 homeless youth with the expectation of housing them and providing resources (such as mental health or job resources and nutritional guidance) until they are independent and stable, eventually adapting this model to other parts of the city. Organizers are aiming towards finding a two or three-flat in the South Shore, Austin, or West Garfield Park neighborhoods, areas that are close to public transportation and are generally supportive of this living model. Despite their articulated goals, Boyd makes a point of noting that their pursuits will adapt to what the youth themselves want and need. Because despite beliefs about their station in life, they will ultimately have a greater sense of what is needed in their own lives as they transition out of homelessness. "They know the needed to have skills in to have control of your past and your destiny," Boyd said. The Slo &apos;Mo Spectacular: A Soulful Holiday Shindig! takes place on Saturday, Dec. 14 at the Bottom Lounge (1375 W Lake). Tickets are $15 and the event begins at 8 p.m.